At their best from November through to about April, British leeks are a delicious vegetable that is so versatile that it can be eaten both cooked or raw. Leeks are smoother and sweeter in texture than traditional onions and are packed with nutrients and anti-oxidants which help boost the immune system keeping the body healthy, helping to fight off winter illnesses such as the common cold and flu. Leeks belong to the allium family and have been around for thousands of years and it is believed they were introduced to Britain by the Romans and are they are even mentioned in the Bible! In fact, in some countries such as Portugal you can still find leeks growing wild although these are smaller in size and have a much stonger flavour. Rather appropriately to Bomber County Produce, leeks are known in France as the 'poor man's asparagus' and with both of these vegetables being grown on the farm they make a perfect pair. Today, the varieties of leeks that are grown by Bomber County Produce are selected for their size and colour, resisitence to pest and disease and their suitability for the time of year when they are at their most vunerable growth stages. Some varieties prefer a slightly warmer growing climate whilst other varieties prefer colder conditions and will withstand hard frosts and snow, helping to ensure that Bomber County Produce can supply leeks throughout the British season. Bomber County Asparagus follows the traditional British asparagus season which lasts from about the 24th April to the 21st June. We allow our asparagus to grow at its own pace and don't force its growth, meaning that the start of the seaon can vary depending on the lovely British weather... Our asparagus is harvested by hand every day to ensure that it is as fresh as possible for our customers. Bomber County Asparagus, is planted from 'crowns' which take three years to grow to a harvestable crop and we should be able to harvest from one crown for up to ten years. The size and shape of the asparagus that we harvest varies as it is hand grown and cut. 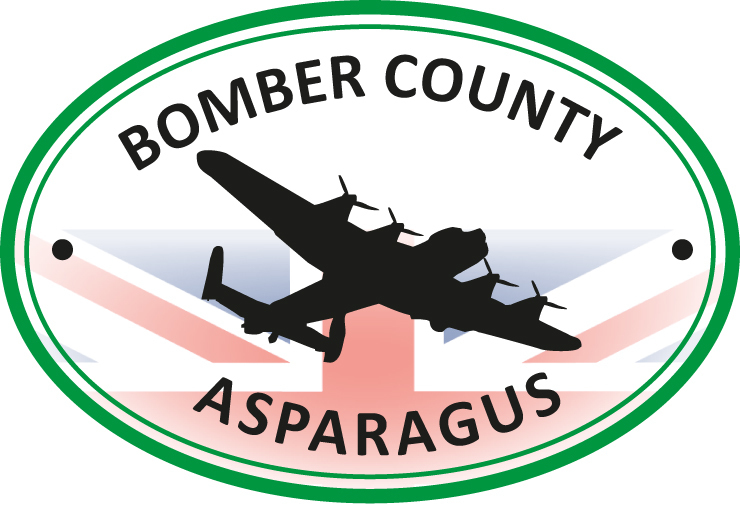 There are actually three colours of asparagus, green, purple and white, although at Bomber County Produce we are currently growing more of the more popular green variety with only a small amount of purple asparagus. Like leeks, the health benefits of eating asparagus are many and it is known as a 'superfood'. It boosts the immune system as it is packed with vitamins A, B and C, is virtually fat-free and is full of fibre and folic acid. Asparagus, a member of the Lilly family has been documented as far back as Eygiptian times and was later eaten by the Romans who grew and cultivated it and it is also said, introduced it to Britain along with the leek. It is said that the Romans loved eating asparagus so much that the Roman Emporers sent out 'asparagus fleets' to bring back the finest asparagus for them to eat. The Romans were also the first known people to preserve their asparagus by freezing it high up in the Alps.